1 foil stamped area on Side 1 of uncoated 100lb Deep Black Linen stock. 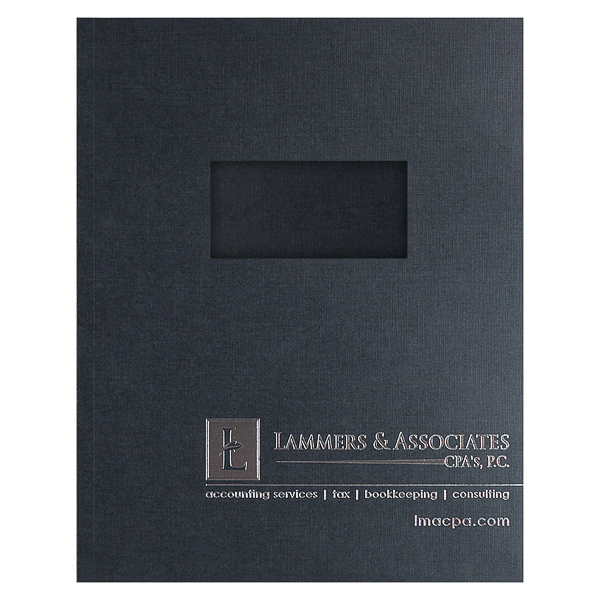 Elegant black panels and Metallic Silver foil establish a classic style for accounting firm Lammers & Associates. Combined with the texture of the linen stock, the smooth foil stamp creates a tactile experience that helps clients form sensory brand memories. The die-cut window in the cover offers a preview into the design's contents. 1 foil stamped area on Side 1 of 120lb C2S White Gloss stock. Coated with Aqueous Gloss. H1 business card slits on left pocket. Crisp white panels suggest perfection and attention to detail—two things that clients want from their accounting firm. 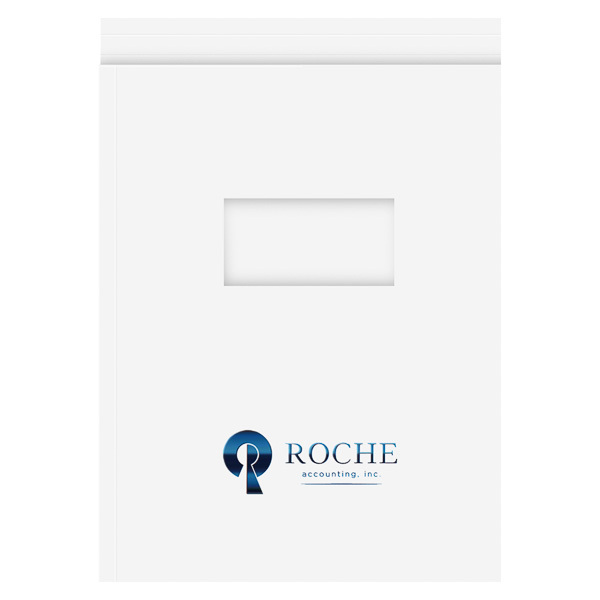 A sparkling metallic sapphire logo reinforces Roche's brand colors and adds a playful element to the design. Its reflectivity creates a sense of motion, as light bounces off the foil when clients open the cover. The mix of slim serif and sans serif letters completes the design with a classy, yet modern feel. 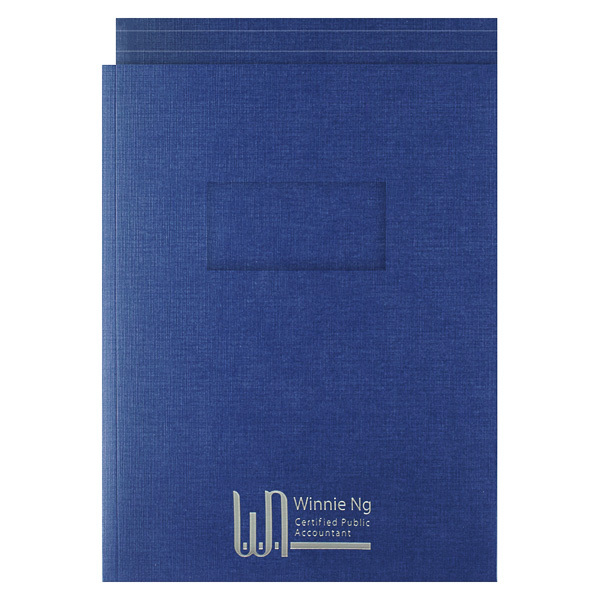 Accountant Winnie Ng chose dark blue linen stock for its executive color and look. The stock's thick, woven texture gives the design a luxurious feel. Metallic Silver foil type likewise implies luxury and wealth; its reflectivity mimics the shininess of new silver coins. The foil stamp also has a smooth surface that contrasts the linen stock, helping clients form strong sensory memories of the brand. Durham, Nunnery, Poyner & Walters, P.C. Side 1 printed with 1 embossed area and 2 foil stamped areas on uncoated 80lb New Black Felt stock. H1 business card slits on the left pocket. The black, silver and gold color scheme of this design represent sophistication and luxury. Durham, Nunnery, Poyner & Walters, P.C. went with a simple design, featuring only the accounting firm's name in a Metallic Silver foil stamp with a Metallic Gold accent. The foil stamps add shine to the elegant design. Equipped with two storage methods and an extra wide spine, this high-capacity product can carry a packet of 8 1/2" x 11" print media up to 3/8" thick. The right fold-down tab lets you staple tax, financial, or other documents securely in order. 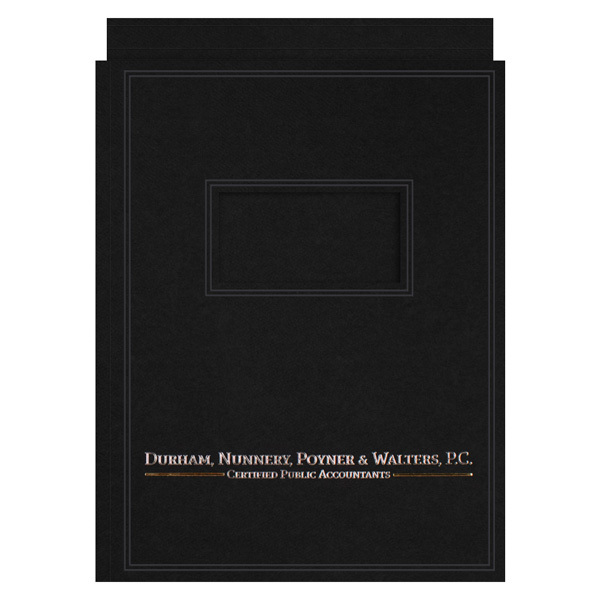 Its triple scores allow the fold-down tab to bend around the tops of the papers; this protects the pages' upper corners and hides the staples for a sleek interior style. The 3 1/4" left pocket is an inch shorter than standard, exposing more of the contents for easier access. As an added bonus, this product is reusable: simply place a new title page behind the 4" x 2" window to customize it for different clients or seasons. Coating: Free of charge: Overall Gloss, Satin or Matte Aqueous. Additional charge: UV, Spot and Soft Touch. Dimension Closed: 8 3/4" x 11 3/4"
Dimension Open: 17 7/8" x 12 7/8"